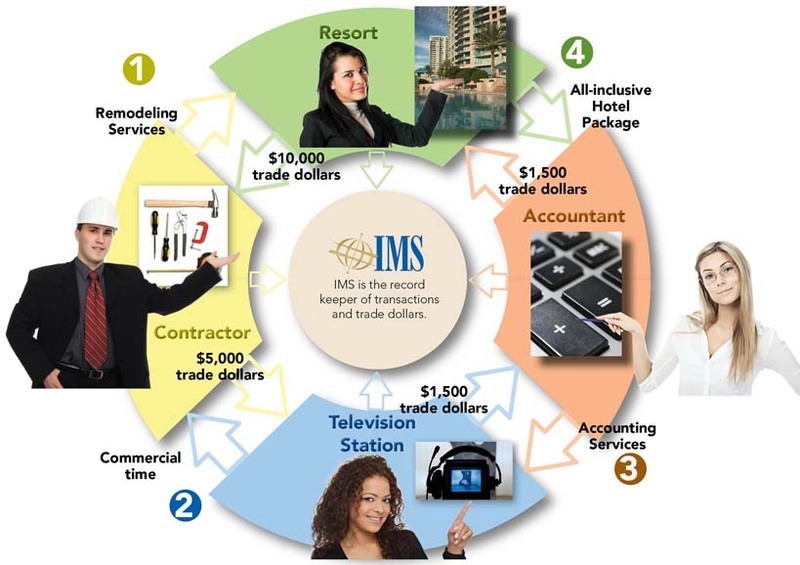 Below is a flowchart to help you see how bartering in the IMS Network can help your business save cash, sell your excess inventory, get new customers and increase sales. 1. As an IMS member, the Contractor provides $10,000 of remodeling services to another IMS member, the Resort. The Contractor receives $10,000 trade dollars to his IMS account. 2. The Contractor uses $5,000 trade dollars to buy commercial time at a local Television Station. The Television Station receives $5,000 trade dollars. 3. The Television Station barters for $1,500 of accounting services. The Accountant receives $1,500 trade dollars to his IMS account. 4. The Accountant books a resort vacation package for $1,500. The Resort receives $1,500 in trade dollars. These businesses are free to trade with each other and with over 16,000 business in the IMS nationwide partners throughout North America.